Welcome to NOC Helper : WorldWide Friendship! 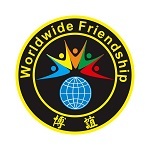 WorldWide Friendship Pins (WWF for short) has been in operation now since 2016. Our goal is to help all the NOC to be stronger and play better in the competition. We have been working with many different National Olympic Committees (NOC for short), Sporting Federations during the games. As a result of the work we have done, we have helped some NOCs get better performance and also we have some good products. Then, our friends became more and more, and our products will be better and better. We are the bridge between Olympic pin collectors and NOCs/Federations, so we help each other and we grow up together!